Join Stitchin' Heaven and friends on a 7-night Alaska Sawyer Glacier Cruise! Cruise and learn from quilting experts: Carol Doak, Karin Hellaby, and Lucy Sessions. As usual, we bring you several quilt projects to work on, taught by amazing and talented instructors and designers in the world of quilting: Carol Doak, Karin Hellaby, and Lucy Sessions. Carol's lighthearted approach and ability to teach have earned her high marks and positive comments from workshop participants worldwide and at national shows such as the Houston International Quilt Festival and the American Quilter's Society Show. If you have ever taken a class from Carol, you know that her enthusiasm for quiltmaking is infectious. Carol has a gift of sharing her inspiring ideas with her students in such a positive and unique way. 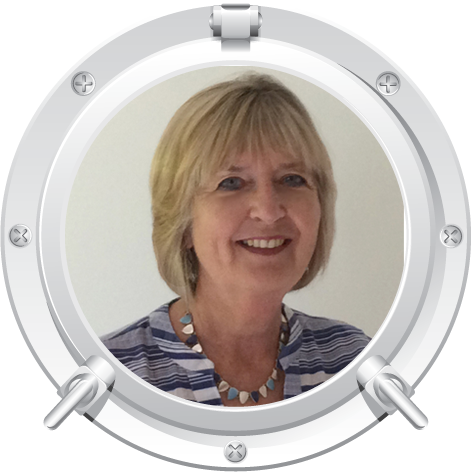 Carol has traveled to teach extensively through the United States including Alaska and Hawaii and as far away as England and Australia. In April 1999, Carol was awarded the 8th Honors Award from the Eastcoast Quilters Alliance in recognition of her outstanding influence in the field of quilting. In September 1999, her book, Easy Machine Paper Piecing, was named by Quilter's Newsletter Magazine as one of the 30 most influential books in the past 30 years. She was also nominated as one of 24 All-American Quilters in 2004 and 2005 Professional Quilter of the year. In 2008, Carol Doak was Awarded Favorite Paper Piecing Teacher, by the Quilter's Newsletter Reader`s Choice Awards. Carol's history in the quiltmaking is nothing short of remarkable, and the future of quiltmaking will benefit from her generous knowledge, enthusiasm, and most of all from her love of quilts. Karin Hellaby was born in the north-east of England to Norwegian parents. She studied for a Home Economics degree in Education from the University of Wales. She now lives in Suffolk, UK and is the owner of one of the UK’s leading quilt shops – Quilters Haven. In 1998 Karin won the Michael Kile Award for International Retailer of the Year, awarded by the Houston Quilt Market/Festival organizers. Karin loves traveling, and has enjoyed teaching at International Quilt Markets and Festivals in the UK, USA, Canada, New Zealand, Europe, and the United Arab Emirates. She has taught many times at the largest outdoor quilt show in the world, an annual event in Sisters, Oregon where one year she had a solo display of her quilts. Karin’s first four wonderful resource books bring quilt making into the 21st century offering students multi- techniques within new designs. Karin’s workshops illustrate her philosophy well – several types of patchwork taught and sewn in one class and then stitched into an original pattern design, very achievable and lots of fun! Lucy Sessions is a talented quilter and a teacher. For her, it’s all about sharing the knowledge, from focusing on quilting basics to utilizing her knack for deciphering the most complex patterns. Her enthusiasm for teaching combined with her natural wit and her extensive knowledge of quilting techniques make her a hit in any classroom. For the past eight years, Lucy has taught a large variety of classes at Stitchin’ Heaven in Mineola, Texas. She hosts two retreats per year and is a hostess on cruises for Stitchin’ Heaven. Lucy’s teaching experience includes everything from beginning sewing to advanced tailoring. 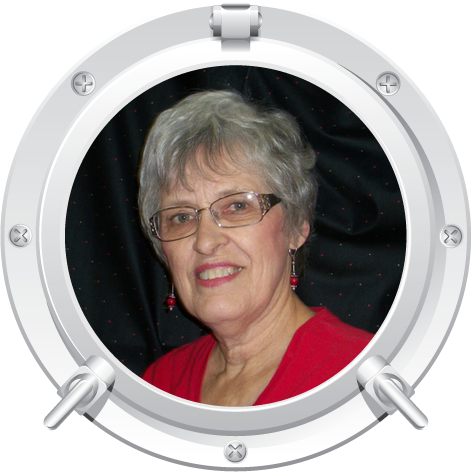 She has always had in-home sewing business including draperies, tailoring and custom clothing. In 1990, Lucy enrolled in an all-night quilting class leaving the next morning with a completed quilt top and a new passion. During the 1996 Atlanta Olympics, Lucy’s quilt “Bird of Paradise” was presented to the flag bearer from St. Kitts. In 1997, Lucy was commissioned by Georgia’s Bibb County School Board to design and make a quilt. The finished quilt measured 18’ by 6’ and hangs in school board meeting room. In 2009, Lucy’s husband bought her a long-arm quilting machine…and so began another career. Lucy now manages the Stitchin’ Heaven Long-arm department. Lucy and her husband, Dennis, currently live in Quitman, Texas. They have five children and 13 grandchildren. 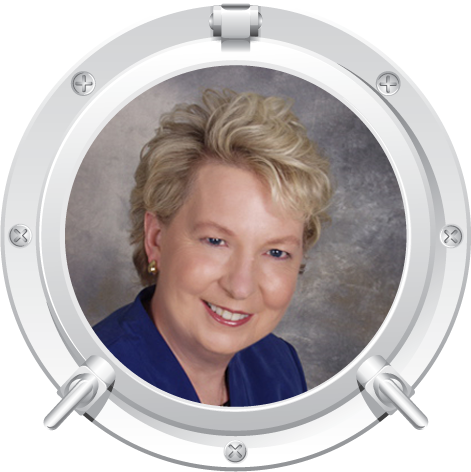 In August of 2016, we will discover gold on the Explorer of the Seas with Carol Doak. With the unearthing of our precious fabric, she will ignite the largest of all the gold rushes that will occur in 2016. The last great gold rush in American history was the Klondike Gold rush of 1898 and 100,000 rugged souls were irresistibly drawn to seek their fortune. In 2016, 75 eager quilters will be likewise drawn to seek the solution to another treasure from Carol Doak. Join us to make history, become a prospector and find your fortune. Finished Size: Finished size for this project will be 54" x 54". Wow! Just look at how this quilt moves! and you can fast stitch this quilt in no time using Karin’s wonderful fast geese techniques.Scrappy white and cream fabrics have been used to create this swirly snowstorm on a dark night but you can change the theme with your own fabric colour choice. Think of leaves blowing around on a blustery day or a whirling sandstorm! 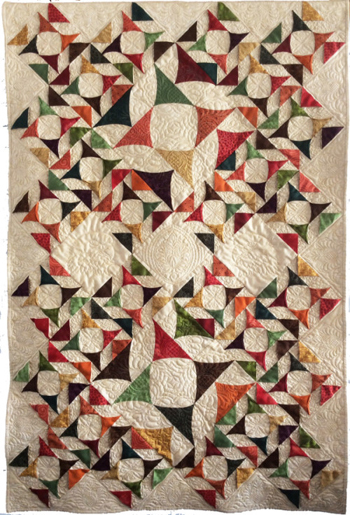 You will be shown at least two of the 25 different geese techniques from Karin's Fast Flying Geese Quilts. Karin will also demonstrate her speed cutting techniques and suggest ideas for quilting and embellishment. Finished Size: Finished size for this project will be 34" x 46". Ice Castles is another Deb Luttrell original that was featured in McCall's magazine. This design takes a classic star block and pairs it with striking fabrics to achieve a quilt that really shines. 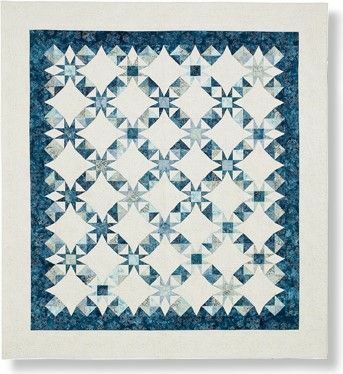 Blue batiks sparkle against a frosty background, leaving this crisp blue and white quilt lookinggreast throughout the season. Lucy will give you all kinds of tips and tricks on how to use the Tri-Recs Tools to achieve a result that should be difficult in an easy way. Finished Size: Finished size for this project will be 93 1/2" x 102. 1/2". Our incredible Sail 'n Sew fabric pack includes all of the fabrics and patterns for your projects and they are pre-cut so all you need to do is sit down and sew! 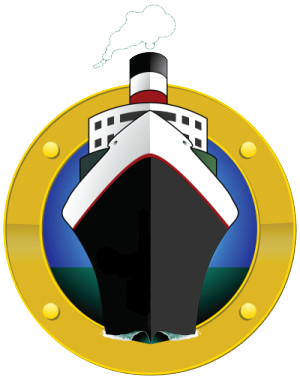 The price of the Sail ‘n Sew fabric pack is $400.00 and it includes all three of the projects for this cruise. Individual kits can be purchased per project. If you would like a Sail ‘n Sew pack, just let us know when you make your Reservation and we'll have a kit waiting for you on the ship. Order early as supplies are limited. If you do not wish to purchase a Sail 'n Sew Fabric Pack, remember to pack your own fabrics. 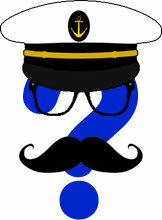 We will not have fabrics available for purchase aboard the ship. You will need to bring your fabric pre-cut and ready for class. You must also bring your pattern or book. These can be purchased here. We will not have patterns for purchase on board for the classes. Click here for the fabric requirements and cutting instructions. Click here for the Ice Castles Templates. We begin our eight-night Alaskan Cruise out of Seattle, Washington. Seattle is often characterized by its laid-back attitude and rainy climate, but this thriving metropolis also offers one-of-a-kind architecture, the Olympic and Cascade mountain ranges, and a unique urban sophistication. A trip to Seattle isn't complete without visiting Pike Place Market. Here, you can browse the stalls of local merchants and artists, take in a street performance, or watch fishmongers play catch with the catch of the day. On our next cruising day, we will be in the beautiful Alaska Inside Passage. The highlight of any cruise through the Inside Passage has to be Hubbard Glacier. It is one of the most active glaciers in the area and a great place to experience the majesty of a glacier up close. Sheets of ice separate themselves from the ice field in a process known as "galloping." When the ice finally crashes into the sea, you can hear a loud cracking sound, similar to a starter pistol. This process is known as "calving," and the sound echoes for miles. Our next stop is beautiful Skagway, Alaska. where you can enjoy experiencing one of Alaska's most breathtaking valleys while horseback-riding through historic Dyea. Or, you could cruise to a remote beach at Glacier Point, then get aboard a 31-foot canoe and explore spectacular icebergs. Or how about experiencing a once-in-a-lifetime opportunity to design and blow your own glass art in the Last Frontier - complete with real gold in your finished piece. You could also enjoy the unforgettable journey aboard the "Scenic Railway of the World" and travel 20 miles from tidewater to the summit of the White Pass - a 2,865 foot elevation. Ride in vintage rail cars as you retrace the original route to the White Pass summit. This fully narrated tour features panoramas of mountains, gorges, waterfalls, tunnels, trestles and historic sites. We will then visit breathtaking Tracy Arm Fjord, Alaska. Nestled between 3,000-foot high granite walls, the narrow, twisting slice of ocean called Tracy Arm Fjord weaves through the Tongass National Forest for roughly 35 miles. The shoreline is spotted with waterfalls created by melting snowcaps and trees sprouting at odd angles from rocky outcroppings. You will have ample time to admire the landscape and perhaps catch sight of a few native animals as you cruise through this port. Port charges, taxes & fees of $395.07 are not included. During theday,dress is casual. Evenings are either casual, smart casual or formal. On casual nights, suggested attire is sports shirts and slacks for men and sundresses or pants for women. On smart casual evenings, men should don jackets and tie, with women wearing dresses or pantsuits. On the one or two formal nights per cruise, men can choose from tuxedos or suitsandties, while woman usuallywear cocktail dresses.